Pressure sensors and electronic devices may only be used in hazardous areas if they have been tested and approved by a recognised authority in terms of their explosion protection features. So far, this was mostly carried out by a national institution which, after successful testing, issued a national declaration of conformity. Having to obtain a national certification for each country meant significant additional costs for the users who wanted to sell or operate their machines internationally, as well as for the manufacturers of certified electronic devices. The first step towards international simplification in terms of declarations of conformity and certifications was the introduction of the EU directive 94/9/EC “ATEX” in 1994. When using pressure sensors in hazardous areas, the certification of conformity per IEC 60079 (“electrical equipment for hazardous gas atmospheres”) and IEC 61241 (“electrical devices for hazardous dust atmospheres”) is required. An advantage of using instruments with IECEx CoC is that, based on the declaration of conformity and the documents ExTR and QAR, the 32 participating member states can obtain the desired national declaration of conformity in the course of a “fast-track” procedure within a few months. The grand vision of the IECEx system is the complete recognition of the IECEx CoC in all member states, thus creating a single internationally valid declaration of conformity for explosion-proof devices and pressure sensors. However, so far only Australia has recognised the IECEx certificate of conformity, with restrictions, as a replacement for a national Australian certificate of conformity. WIKA offers comprehensive solutions for the use of pressure sensors in hazardous areas. Contact us and we will gladly be of your assistance. 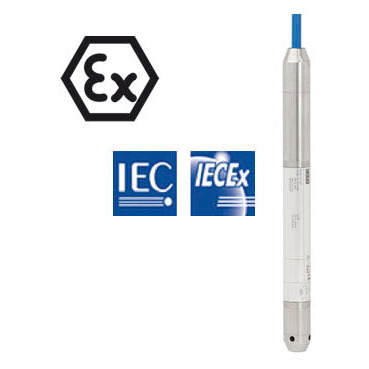 Have a look at the submersible pressure transmitter LH-20 with IECEx.